Rotary Club of Chichester Priory - Welcome! Welcome also from our President GORDON JONES. We're a medium-sized club with 58 members, a diverse, active and friendly membership of men and women from the Chichester District Community. Meeting on Wednesday at the Chichester Park Hotel early evenings at 6.30 for fellowship, business and special events we enjoy working with and supporting our Community. Please look round the site to find out more about what we do, including up-to-date information about our weekly meetings. We are a part of Rotary International, which is the world's largest service organisation for business and professional people. If you are a Rotarian visiting the area, you will be made welcome at one of our meetings - check the Club Diary for further details. Click the 'meeting information' map (right), to get detailed directions on how to find our meeting place. If you're interested in joining Chichester Priory Rotary Club, please make contact (see "contact us" link above) and we will arrange for you to visit. If you are interested in working with us, or would like to ask for our support, use the "contact us" link and we will get in touch! 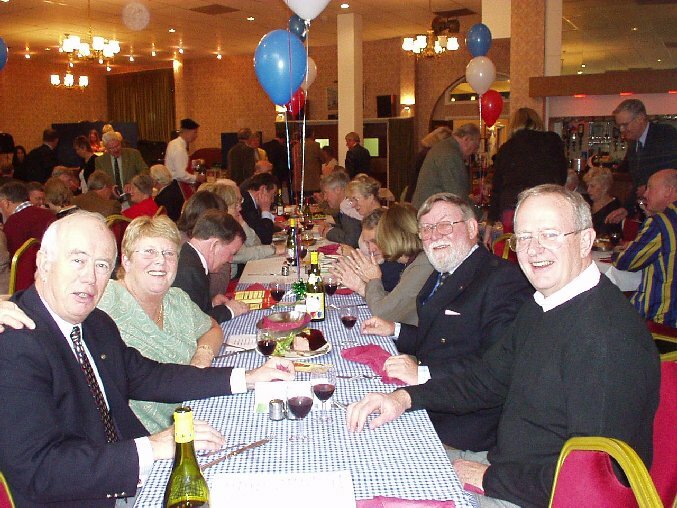 There are two other Rotary clubs in Chichester: Chichester (City), who meet at lunchtime on Tuesdays and Chichester Harbour who meet at breakfast time on Wednesdays. There are also many other neighbouring clubs within West Sussex and a total of 97 clubs in our District 1145. Each club tends to support projects within their own local area, so if you live in a different area, you may want to contact one of the other clubs for support, in which case look at the District Website. 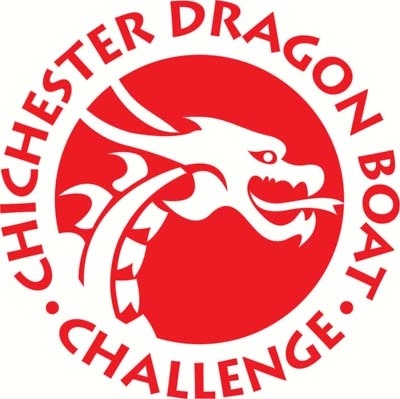 Chichester Rotary Dragonboat Challenge: The 2018 Event took place on Sunday 10th June 2018. Sums raised will go to local charities. See Video at the bottom of the page for illustration of this event! The recent Road Race organised by the Club was the Chichester Priory 10K Road Race at Goodwood. This took place over the new Course starting and finishing at Goodwood Motor Circuit, on Sunday 3rd February 2019. Please see our 10K website or Facebook page for further details. A Great time was had by all, and all in the name of charity! 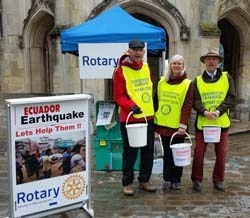 The Three Rotary Clubs of Chichester arranged emergency collections on Friday 22nd April and Saturday 30th April at The Market Cross in Chichester, following the deadly earthquake that had struck in Ecuador, claiming hundreds of lives and reducing buildings to rubble. The citizens of Chichester were so generous and donated £1,300 to this appeal. Through the Rotary organisation we have direct contact with the Rotary Club of Quito Valle Interoceanico in Ecuador within the region to help us to respond to emergencies like this and purchase much needed emergency water purifying equipment. The donations received were wired directly to this Rotary Club for their immediate use to help those poor people so badly affected by this disaster. The deadly 7.8 magnitude earthquake struck Ecuador on 17th April. More than 650 people were confirmed dead and more than 7,000 people injured. More than 150,000 children were affected. Homes, schools and health centres were destroyed. Reports included children being rescued from the rubble of collapsed buildings. More than 200 aftershocks casued widespread devestation. The situation evolved rapidly and the number of casualties continued to rise. When devastating earthquakes like this strike, children urgently need clean water, life-saving food and health care to survive. Your donations provide emergency water and hygiene kits for families affected by the disaster. This was one of the strongest earthquakes to hit Ecuador in decades. We responded to protect the children and families in danger . Thank you for your donations.